The vision of the department is for the faculty to become an active part of the Omani and the Global Education Community. To achieve this, ENGLISH LANGUAGE DEPARTMENT seeks to provide the support to students through an educational environment with related resources, each in their respective field. 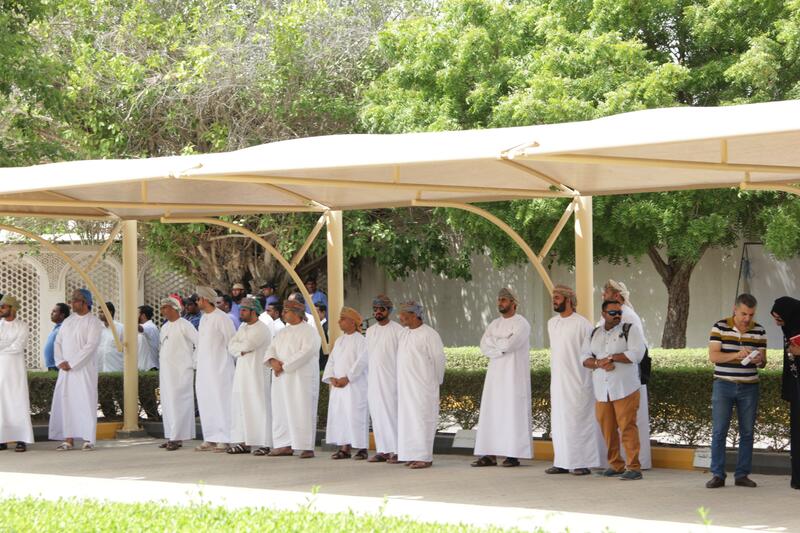 In order to graduate students who are capable of going to working force, the department equips them with the necessary tools and skills as they are considered the future of Oman. It is no secret that the department conveys knowledge of a wide variety of texts and a wide array of vocabularies and practices used to consider enormous aspects. It also gives students an understanding and an appreciation for the English language. It also provides students with sophisticated writing and critical thinking skills useful not only in the academy but also in the world at large. It also offers opportunities to explore identity, values, manners, and morals. The mission of the Department of English Language is to provide a well-resourced learning environment for students that will allow them to graduate as professionally qualified for the job market and well prepared to take their place as key players in advancing the future of Oman. Through diverse and well-qualified teachers, the department is commented to deliver the highest levels of teaching/learning experiences. The English Department at the Sohar CAS helps students build knowledge of the content and methods of English language, academic, and specific or general. In addition, our faculty is committed to an interdisciplinary approach to knowledge, evident in their involvement in various programs. Our graduates are well prepared for professional and graduate study and for lifelong learning. They pursue careers in education, research, business, law, government, and publishing. The Department s policies and its reading- and writing-intensive curriculum demonstrate our commitment to high standards. To provide students with a comprehensive grounding in English language education to support their future career. 2. To graduate professionally qualified and trained students as key players in advancing the future of Oman. 3. To afford the opportunity for Omani students to pursue their studies internationally. 4. To provide an international standard and quality of education to the students of the Sultanate of Oman. 5. To provide delineated lines of professional development for faculty members. 6. To provide relevant and professional assistance to students in the pursuit of their studies. 7. To provide a 21st century technology class-room. 8. To provide a sound pedagogical base to the English Language Programme. 9. To continue to develop all facets of the department, faculty and the teaching progress to afford student and faculty member alike with an international environment. 10. To continue to explore external Oman and international connections and associations designed to further enhance current and future English language programmes. 11. To provide appropriate pedagogies - including class size - and environments (classrooms, equipment, resources, and technology) that will lead o student retention and success as well as an increase in the number of majors and minors. 12. To help students see themselves as professionals, as part of a discipline with skills and abilities valuable in the business, teaching, publishing, or post- graduate work. 13. To give students a sense of themselves as citizens of a larger community by encouraging participation in service learning and in diverse and international course work and programming. 14. To assure that students encounter creativity crucial to English studies through theater productions, readings by professional writers, and their own creative and critical production and presentation. 15. To balance the needs of general education - communication, diversity, global perspectives, interdisciplinary studies - with those of the major. The initial acceptance for students is through Higher Education Admission Center. After getting the initial acceptance, students sit for Placement tests in English, Math and Computer. Based on the results students get, they are placed in different levels. One has to pass all courses in order to enter the specified degree in which the student is accepted to undertake. It is worth mentioning that should a student fail a course, then he or she is given one last chance to retake that course and pass. However, if a student starts form level D (which is the lowest level achieved in placement test), he or she has to pass from the first time in all different levels as he or she will not be given a second chance. As a complement to its mission, the English Department will provide its students, faculty, staff, and dynamic and innovative teaching, and service. As such, the Department’s extra-curricular activities are as follows: 1. Provide current and innovative offerings in the undergraduate of curricula. 2. Provide opportunities and resources for faculty and students to engage in research. 3. Provide outreach through conferences such as the TESOL Conference and creative writing contests for students. 4. Recruit and retain the best possible students for different tasks. 5. Provide students and faculty the opportunity to experience the diversity of people and ideas in academic study and life.